Firstly, “shank” is the official term for the band of the ring and some people may call this the engagement ring setting. So now that you know the term, we can delve into the most popular shank styles and hopefully bring you one step closer to discovering your dream engagement ring setting. Split shanks are graceful and complement many diamond sizes and shapes. This particular style of shank divides into two, before joining with the centre stone, giving the appearance of two separate bands. The split shank can be designed in many different styles. The split shank can be simply separated with a space in between or even woven, twisted, or free form. The shank will merge back together towards the middle of the band to create a single band under the finger. The cathedral shank is one of the most traditional setting styles, imitating the grandeur of cathedral architecture. The way that the shank is crafted in a cathedral style lifts the centre diamond higher off the finger to highlight its beauty and prominence. In this style, the shank delicately tapers upwards to frame the centre diamond between elegant archways. Fishtail style shanks can have a very vintage feel. Here, the small diamonds that line the shank are held together and separated by small cut-outs in the metal that are in the shape of small “v’s”. 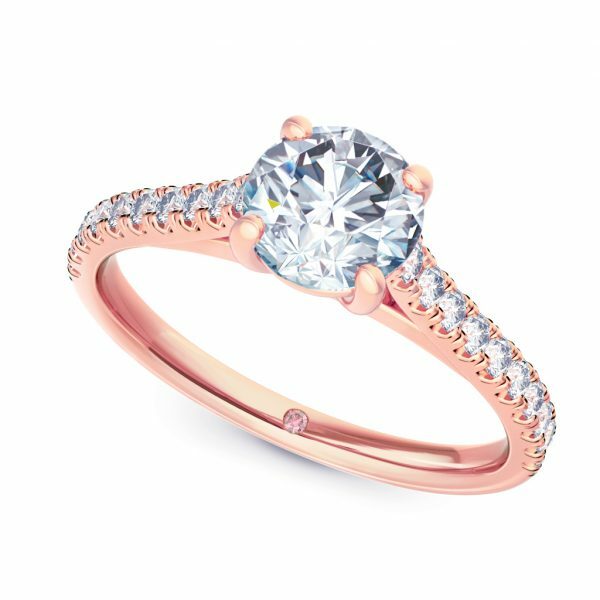 The way that the diamonds are set in this style of engagement ring setting gives the illusion of more sparkle and larger diamonds. A knife-edge shank is characterised by the sharp edge that runs around the outside of the shank. 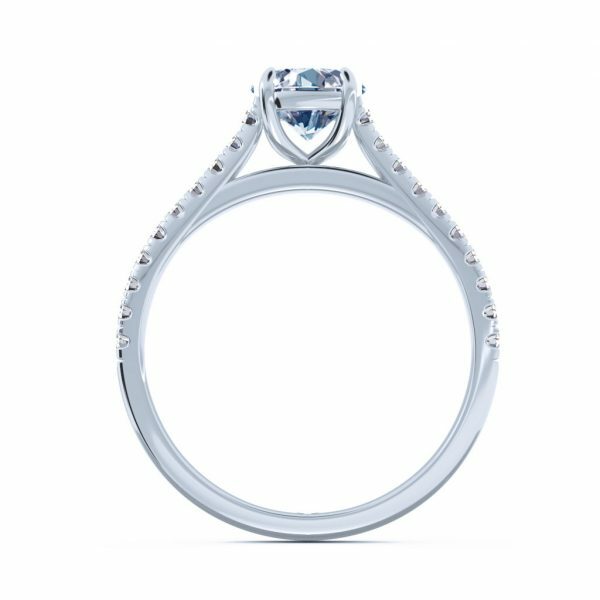 This shank style features two smoothly slanted sides that meet at a point, encompassing the shank and creating a sleek and classic look. Depending on the design of the ring, “sharper” or “softer” knife-edge shanks can be found. The word “pavé” literally means “paved”. 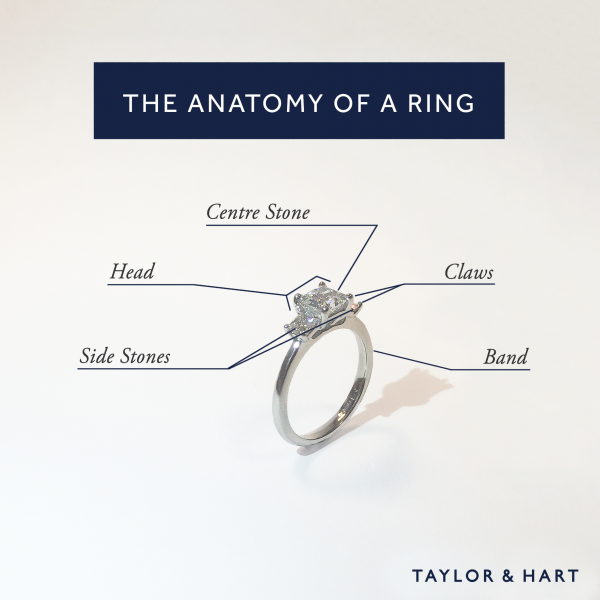 This describes how the pavé engagement rings have a shank that is “paved” in small diamonds, creating a sparkling avenue that gives the illusion that the shank is made entirely of diamonds and making the centre stone pop. The pavé style on the shank are set close together, separated by very small metal beads. The bead-set shank style is closely related to the pavé style. The shank is often set with many small diamonds, like pavé, but what makes it a bead-set shank is characterised by tiny metal beads that line either side of the shank. While there are also metal beads in the pavé shank style, there typically is only one metal bead fastening up to three diamonds whereas in bead-settings there are multiple beads running along the band securing the diamonds. The delicately placed beads give off a glamorous feel while securing the diamonds that run along the shank. In a channel setting, the diamonds are set along the shank in a metal channel. This shank style fastens the featured diamonds between two parallel walls of crafted metal. This style gives the shank a smooth and elegant, modern look. The twist shank style has become increasingly popular over the past few years. As the name suggests, the metal of the shank twists creating a lovely interlacing design around the finger. The twist can either be very tight or looser. This is usually dependent on whether the shank is pavé or just metal. A tapered style is one where the shank either tapers off towards the centre gemstone, or tapers outwards along the band as it circles under the finger. Most common is the style where the shank tapers on either side of the centre stone, creating a delicate resting place for the centre gem and highlighting its prominence. An interlocked shank style is where the wedding band and the engagement ring setting fit together perfectly. This style has many interpretations, from where the wedding ring fits inside of the engagement ring, to where the wedding ring has the exact detailing and design of the engagement ring. 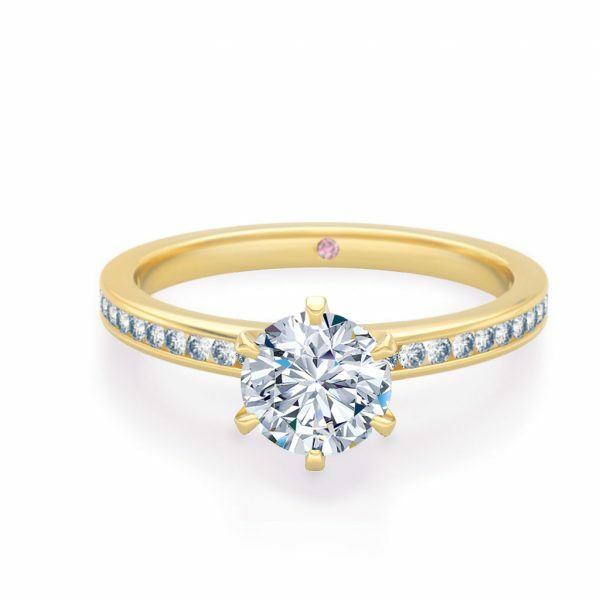 The interlocked shank style particularly complements bespoke and custom-designed rings. The micro pavé shank style is similar to the pavé style except that the diamonds along the shank are even more delicately crafted. 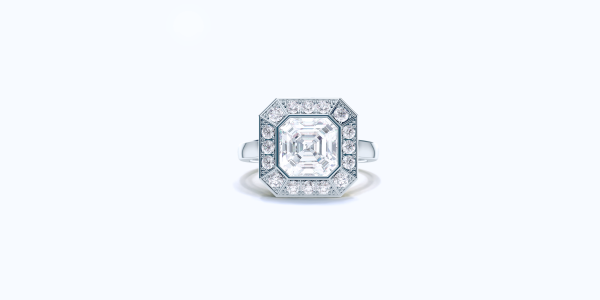 This gives the illusion that the pavé diamonds fuse together, making a brilliant band of dazzling light.